Monday: Limited sun, pop-up showers and downpours, especially during afternoon. Highs in the 50s. Overnight Monday: A sprinkle with lows around 40. Tuesday: Fair and pleasant. Highs 65-70 degrees. The same upper-level storm that prompted showers, downpours and embedded thunder Sunday will trigger them again today, once again resulting in a few spots of small hailstones and graupel or soft snow pellets. Amazingly, as this weather system that dropped up to half a foot of snow in the higher terrain of Vermont early this morning pulls away from New England, we'll make the classic New England shift from wintry to summery in two days — 65-70 degrees Tuesday and 80s Wednesday! The transition will be fairly benign with variable clouds on Tuesday, though a few showers are possible in northern New England as lingering cool air collides with the new warmth. A combination of sun and a southwest wind transporting new air into New England will bring high temperatures into the 80s Wednesday before an approaching cold front from the north triggers scattered showers and thunderstorms Thursday, particularly in central and northern New England. 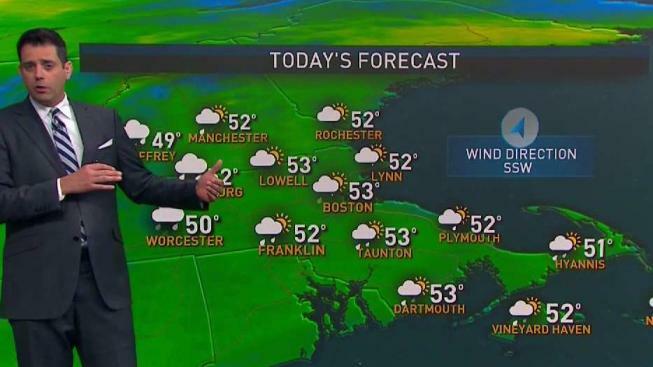 South of the cold front, in southern New England, temperatures will rise into the 80s again. The slow-moving front will nearly stall Friday, serving as a focus for showers and possible thunder as temperatures begin to ease back for everyone. That same front will probably stay fairly close to New England this weekend, meaning we’ll have to keep an eye on its placement and any nearby disturbances, which may trigger showers from time to time. Next week starts seasonable in our exclusive Early Warning Weather 10-day forecast.